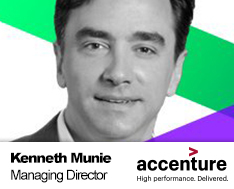 Kenneth Munie is a Managing Director in Accenture’s Strategy practice, focused on Life Sciences. Since joining Accenture in 2004, Mr. Munie has concentrated on commercial strategy & analytics for life sciences clients. He has significant experience in developing and executing digital brand & portfolio marketing strategies, defining and implementing new commercial models, and designing interactions between life science manufacturers and payers & providers. Mr. Munie holds a MBA from The Wharton School of the University of Pennsylvania, where he graduated with honors, majoring in both Marketing & Strategic Management and a B.S. in Electrical Engineering from the University of Michigan.